Idyllic holiday or weekend get-a-way just 92km north of Perth along Wanneroo Road. 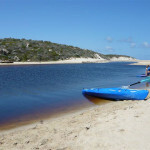 The Moore River enters the ocean here with the area having much to offer the holiday maker. The river and beach are perfectly safe to enjoy. Our user friendly cottage is adjacent to the beach which is ideal for swimming, surfing, sunbathing, beach combing, and fishing, diving or simply watching the sunset while enjoying a quiet drink. Canoe, paddle boat and dingy hire are available at the river mouth. One hour north of Perth. Instant water slides. Fantastic outdoor fun. Kerry Enright and her team at Guilderton General Store aka 'the Bottom Shop', are fast becoming known as the shop that sells the best fish and chips along the coast. Just had a cancellation, cottage now free from 19th December -25th Dec.$205.00 per night, min two nights sleeps eight.